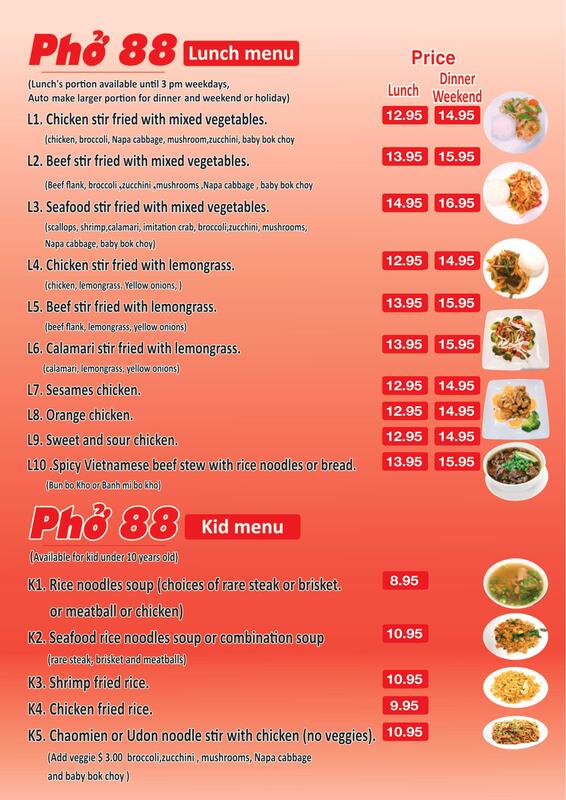 Let’s visit, have a relaxing time & enjoy the good food at one of the best restaurants in Colorado: Phở 88. Phở 88 is a famous food address for everyone in the city of Grand Junction, Colorado, zip code 81505. At our restaurant, we specialize in serving the Vietnamese special dishes from eggs, pork, beef, chicken, and seafood. The most famous type of food in our restaurant is Pho. Pho is known as a Vietnamese specialty made from flavorful broth, soft (but not mushy) rice noodles and tender meat. A slice of lemon, pepper & a side plate of fresh herbs will awake your taste buds. Rice noodle with onions, bean sprouts and Thaih basil in hearty beef broth. Jalapeno as requested. Rice noodle, Vietnamese eggrolls, Vermicelli with grilled beef, shrimp, Vermicelli with grilled pork, shrimp with homemade fish sauce. Classic fried rice with bean sprouts, peas, carrots and onions Served with soup or salad. Copyright © 2018 Pho 88. All rights reserved.